How frustrating is it when your gas furnace fan is blowing cold air. Especially if you recently purchased it. Did you get a lemon? Not necessarily. There are many reasons a furnace fan is blowing cold air and won’t shut off. We will discuss the top 12 reasons why in this posting. The very first step you should take is to check the thermostat. If you discover the thermostat is set to ON—bingo! It’s an easy fix. Simply reset the thermostat to AUTO. What causes the heater fan to emit cold air is the ON switch allows the fan to operate even when heat isn’t required to maintain temperature control. Checking the pilot light and seeing if it is out could be a quick fix also. If the pilot is out you can try relighting it. If the flame catches and continues to burn, you’re in the clear. However, if you can’t get the pilot light to ignite, first inspect the gas valve switch to see if it’s turned on. If it’s on, the next step is to inspect the pilot light for signs of dirt build-up. You can quickly clean a dirty pilot light, which will permit gas to travel to it. If you find the pilot light ignites but then goes out you have a thermocouple issue. It needs re-adjustment or replacement. Not confident about working with the thermocouple? Then it’s time to call in an HVAC heating contractor. Newer gas furnaces come with a computerized control panel. As with a computer, which is experiencing software problems of one nature or another, restarting it oftentimes resolves the issue. So too with an electric control panel. Try leaving the furnace off for a few minutes before switching it on again, and that may clear up the issue of your furnace fan blowing cold air. If you’re asking: why is my furnace blowing cold air when the heat is on? It’s possible your furnace could be overheating due to a dirty air filter. Because air flow is interfered with, your furnace overheats and turns off the burner, causing the heater fan to emit cold air. Replacing the dirty air filter and restarting the furnace may do the trick. Whether you own a gas or oil furnace, dirt build-up on the burners may be the reason the burners can’t ignite. Consequently, the furnace fan is blowing cold air instead of heat. In this case, an HVAC contractor needs to be contacted to perform a professional cleaning on the burners, and any other components that have accumulated too much dirt and debris. The flame sensor is another component that can’t function correctly when it’s blanketed in dirt. The result is the burners will shut down, and you now have the furnace blowing cold air with no heat. When an oil furnace is blowing cold air, it may be the oil filters have become plugged up with grime and other material matter. An obstructed filter can affect the ignition system adversely, causing the furnace fan to blow cold air. Newer model gas furnaces contain an electric ignition system, which if not adjusted correctly could cause your furnace to blow cold air. You may notice cold air blowing out of vents when the heat is on. The ignition system could also be worn out and need replacement. Old ductwork can develop apertures, which causes heated air to leak through the openings. Heated air becomes cold air as a result. Your furnace’s fan can do nothing but deliver cold air to your home. If you maintain an oil furnace, which is blowing cold air, it’s possible the fuel in the oil tank has run dry. This causes the burners to fail and the heater fan to emit cold air. Three possible reasons the gas furnace is blowing cold air and won’t shut off is the gas supply is not feeding the furnace, or it could simply be shut off. A third reason could be due to a blockage in the gas line your furnace is not receiving an adequate supply of gas. Without fuel to burn and heat the furnace, the furnace fan can only put out cold air. Modern high-efficiency gas furnaces contain a condensate drain line. Its function is to eliminate the water that occurs during the conversion process from combustion gases. An impeded drain line can trigger a switch to keep the burners from turning on. 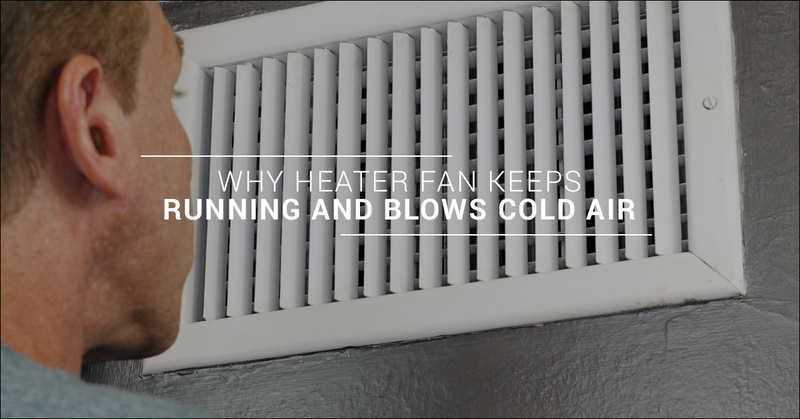 What happens is the heater fan blows cold air instead of warm air.